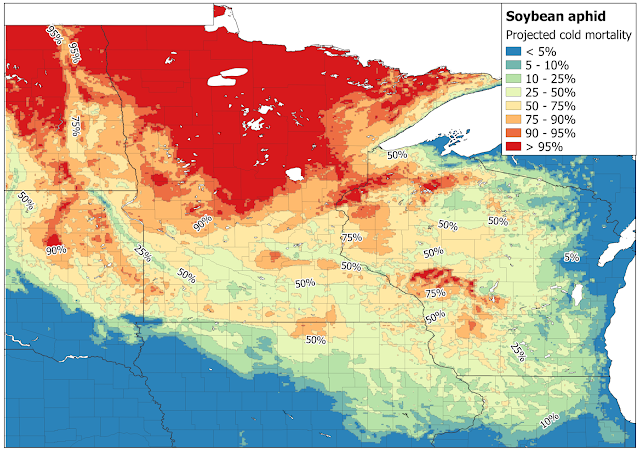 Insects and the Polar Vortex: How will soybean aphid fare in 2019 after the cold winter? On January 31, 2019, most of Minnesota had morning lows near or below -30°F (Figure 1). Cold winters help prevent many potential pest insects from establishing here or requires species that cannot survive our winters like potato leaf hopper or black cutworm to migrate up from southern states. Extreme cold can also knock back species that are established here. Figure 1. Morning lows on Jan. 31, 2019; U.S. National Phenology Network: www.usanpn.org. For the most part, insects match the temperature of their surrounding environment, making them "cold-blooded." Wind chill doesn't really affect them, but air temperature does. Even so, many insects can survive temperatures well-below freezing due to their own antifreeze compounds like glycerol. Similar to weather forecasting, insect forecasting can give us a general idea of future insect populations. The minimum winter temperature can help forecast freeze mortality. Where insects overwinter also affects mortality. Some insects, like corn rootworm, overwinter in leaf litter or soil, where they are protected from temperature extremes, especially when there is heavy snow cover. Most areas of Minnesota had between one to two feet of snow cover during the coldest parts of this winter. Pests directly exposed to air temperature, like soybean aphid, would be most affected by the cold snap. Because soybean aphid overwinters as eggs on buckthorn buds, there is little protection from cold exposure, unless they are under insulating snow cover. 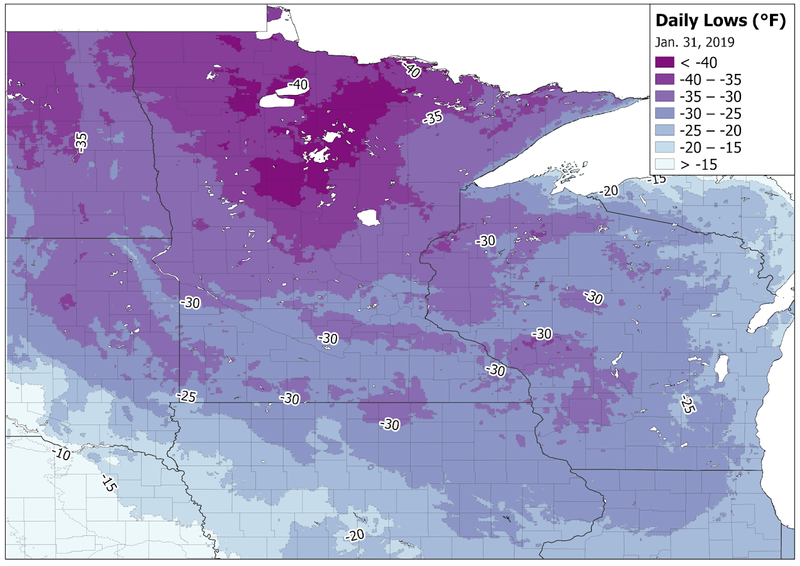 Eggs will freeze between -25 and -35 degrees F1, temperatures that were widely seen across Minnesota on January 31. Some egg mortality can also occur above freezing, due to dehydration and late-fall cold snaps. Cold temperature mortality may be high in parts of Minnesota (Figure 2). In addition, sustained low temperatures just above lethal temperatures can cause more mortality than what is projected on the map (e.g. two nights in a row near -30 degrees F). The late January cold snap won't eliminate soybean aphid from Minnesota, but it could reduce early-season populations in some areas. Winter mortality is only one piece of the puzzle when forecasting if an insect pest will be a problem. In the case of soybean aphid, winged aphids are very mobile and can colonize new areas by field-to-field flight or long distance travel on air currents. Wintering populations are present over large parts of the Upper Midwest where temperatures were not as lethal. Many insect populations can grow quickly, so even a small percent of the surviving population can still cause problems for soybean growers under the right conditions. Start scouting early in the year so you can stay on top of soybean aphid populations. For more information, visit Extension's Soybean aphid website. Figure 2. Predicted soybean aphid cold-exposure mortality on Jan. 31, 2019 based on average freezing point of overwintering eggs at -29 degrees F (std. dev. : 3.4) and minimum air temperature. European corn borer (ECB) overwinters in corn stalks and other plant material on the ground for the most part, so it's going to be more protected from the cold than soybean aphid. That also makes it more difficult to forecast winter mortality, especially with the heavy snow cover we had.